What looks like an abandoned concrete business plaza can surprise you with amazing local restaurants. We found an incredible Ramen noodle spot, Fukumimi Ramen, in a strip mall that looked 75% vacant. In another mini plaza we fell for a Bavarian Cream Croissant from Great Buns Bakery that will send you into a decadent sugar coma. 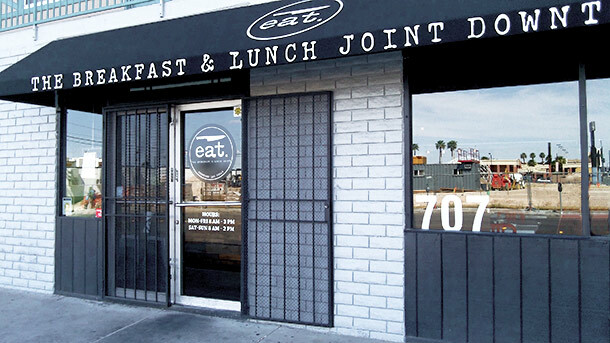 Both spots are less than 20 minutes east of the Strip and super friendly to your wallet. Be brave and explore, do some research and you’ll find great places to eat without ever going to the Strip. With a diverse ethnic population, locals have a wide range of food spots to choose from. Information from the USA.com shows Hispanics make up 31% of the population, African-Americans 11% and Asians 9%. USA.com shows the following breakdown of first generation descendants living in Las Vegas including: Germans: 10.54%, Irish: 8.35%, English: 6.55%, and Italian at 6.32%. The locations below are popular with locals and have been a repeat hit with visitors. They are also budget friendly, all $ or $$ out of a range of $ – $$$$.